The artwork on Pensacola’s iconic Graffiti Bridge changes constantly, but the change remains consistent. 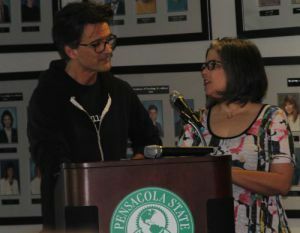 That was the inspiration for Rachael Pongetti’s book, “Uncovering the Layers: The Pensacola Graffiti Bridge Project,” which was the subject of the April 11 Book Talk at Chadbourne Library. Pongetti, a former art instructor at Pensacola State College who now teaches at Pensacola High School, considers the book to be a co-creation. “I feel like too many people have been involved to call it my book… When you collaborate with somebody, you really begin to expand who you are and who you think you are,” she said. Jones, who first met Pongetti at a poetry reading, donated money to her Kickstarter fund, then offered to help with proofreading and eventually contributed his own poetry to the project. He said the more involved he became, the more he recognized the collaboration between photographer and poet allowed him to move forward as an artist. She and Jones also were intrigued by all of the shared connections they discovered between themselves – connections to the railroad, the bridge, and to each other. “If you just keep doing what you’re doing, these things eventually come out in some form,” said Pongetti, who added the two have now become a couple. Pongetti and Jones were joined in the discussion by dancer Genevieve Fortner, and the three read several of Pongetti’s journal entries, which were featured in the book. Fortner also performed an interpretive dance while Jones recited his poetry to accompany Pongetti’s video. For Pongetti, the ever-changing appearance of the bridge has provided her with the opportunity for personal growth, allowing her to let go of attachments and expectations. “Someone’s going to paint over it eventually, but that just allows me to do something new. That’s the beauty of Graffiti Bridge,” she said. More information on the project can be found at pensacolagraffitibridgeproject.com.